Some time ago I wanted to monitor the performance of a network of Devolo dLAN devices. These are power-line Ethernet adapters. Each device looks like a power brick with a standard Ethernet RJ45 port. You can plug several of these into wall sockets around a building and theoretically they will together act as an Ethernet bridge, linking all their ports as if they were connected to a single network. The power-line network in question seemed to be having intermittent problems, but without some kind of a log it was hard to pin-point exactly what was the problem. I have very little experience with power-line networks and some quick web searches yielded conflicting information about how these things work and what protocols are at work behind the curtains. Purely from the user perspective, the experience seems to be similar to wireless LANs. While individual devices have flashy numbers written on them, such as 500 Mbps, these are just theoretical "up to" throughputs. 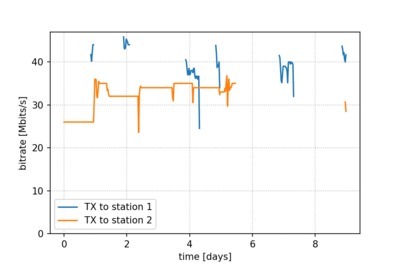 In practice, bandwidth of individual links in the network seems to be dynamically adjusted based on signal quality and is commonly quite a bit lower than advertised. Wireshark immediately showed the captured packets as part of the HomePlug AV protocol and provided a nice decode. This finally gave me a good keyword I could base my further web searches on, which revealed a helpful white paper with some interesting background technical information. HomePlug AV physical layer apparently uses frequencies in the range of 2 - 28 MHz using OFDM with adaptive number of bits per modulation symbol. 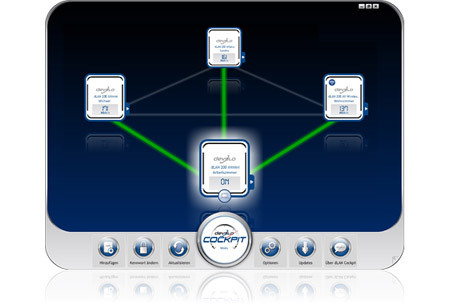 The network management is centralized, using a coordinator and a mix of CSMA/CA and TDMA access. However before diving directly into writing code from scratch I came across the Faifa command-line tool on GitHub. The repository seems to be a source code dump from a now-defunct dev.open-plc.org web site. There is very little in terms of documentation or clues to its progeny. Last commit was in 2016. 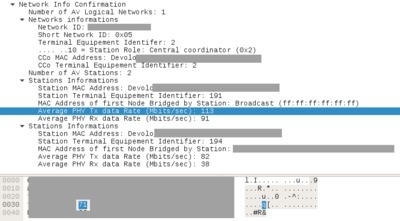 However a browse through its source code revealed that it is capable of sending the 0xa038 Network Info Request packet and receiving and decoding the corresponding 0xa039 Network Info Confirm reply. This was exactly what I was looking for. The original tool had some annoying problems that I needed to work around before deploying it to my monitoring system. Most of all, it operated by sending the query with Ethernet broadcast address as the source. It then put the local network interface into promiscuous mode to listen for broadcasted replies. This seemed like bad practice and created problems for me, least of which was log spam with repeated kernel warnings about promiscuous mode enters and exits. 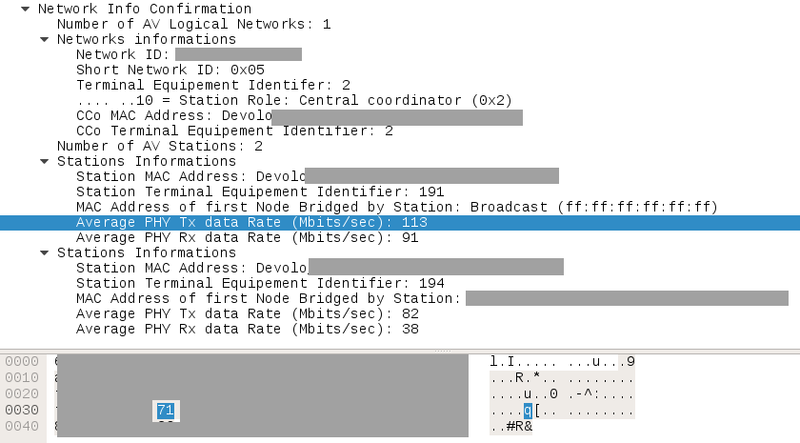 It's possible that the use of broadcasts was a workaround for hardware limitation on some devices, but the devices I tested (dLAN 200 and dLAN 550) seem to reply just fine to queries from non-broadcast addresses. I also fixed a race condition that was in the original tool due to the way it received the replies. If multiple queries were running on the same network simultaneously sometimes replies from different devices became confused. Finally, I fixed some rough corners regarding libpcap usage that prevented the multi-threaded Faifa process from exiting cleanly once a reply was received. I added a -t command-line option for sending and receiving a single packet. Even this graph shows some interesting things. Some devices (like the "station 1" here) seem to enter a power saving mode. Such devices don't appear in the network info reports, which is why data is missing for some periods of time. Even out of power saving mode, devices don't seem to update their reported bitrates if there is no data being transferred on that specific link. I think this is why the "station 2" here seems to have long periods where the reported bitrate remains constant. 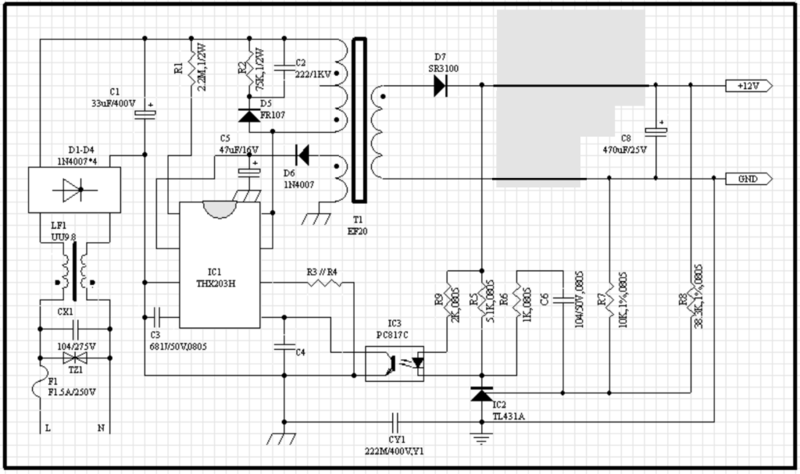 I was recently investigating a small switch-mode power supply for a LED driver. When I was looking at the output voltage waveform on an oscilloscope it occurred to me that it looked very little like the typical waveforms that I remember from university lectures. So I thought it would be interesting to briefly explain here why it looks like that and where the different parts of the waveform come from. From top to bottom are the primary coil current, secondary coil current and output voltage, not drawn to scale on the vertical axis. First the ferrite core is charged by the increasing current in the primary coil. 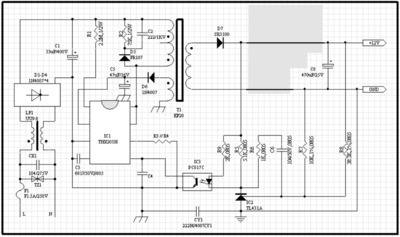 Then the controller turns off the primary current and the core discharges through the secondary coil into the output capacitor. 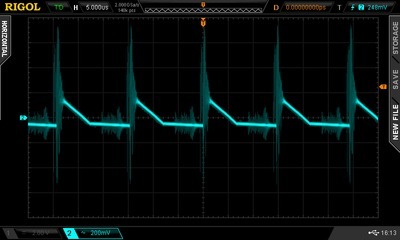 Note how the ripple on the oscilloscope looks more like the secondary current than the idealized output voltage waveform. The main realization here is that the ripple in this case is defined mostly by the output capacitor's equivalent series resistance (ESR) rather than it's capacitance. The effect of ESR is ignored in the idealized graphs above. In this power supply, the 470 μF 25 V aluminum electrolytic capacitor on the output has an ESR somewhere around 0.1 Ω. 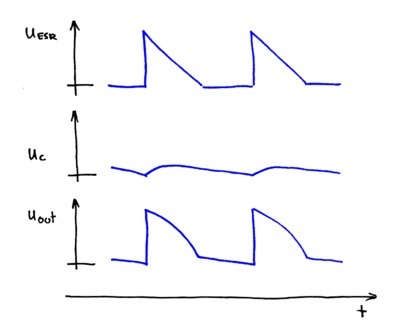 The peak capacitor charging current is around 3 A and hence the maximum voltage drop on the ESR is around 300 mV. On the other hand, ripple due to capacitor charging and discharging is an order of a magnitude smaller, at around 30 mV peak-to-peak in this specific case. 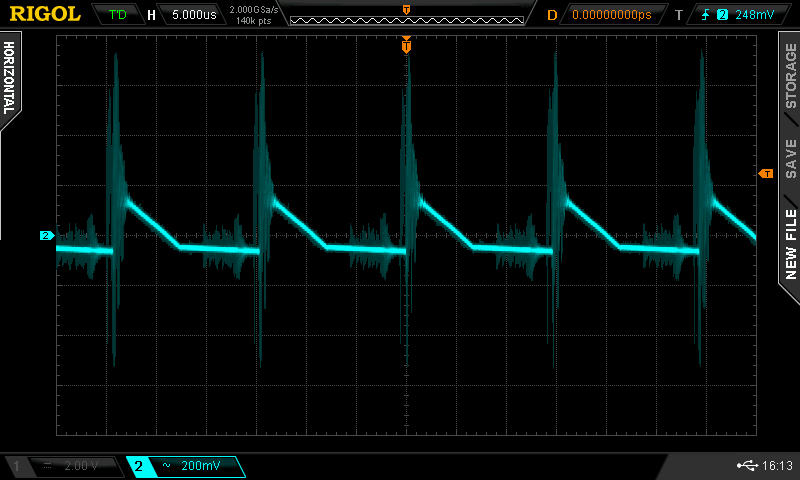 Adding the ESR drop to the capacitor voltage gives a much better approximation of the observed output voltage. The break in the slope marks the point where the coil has stopped discharging. 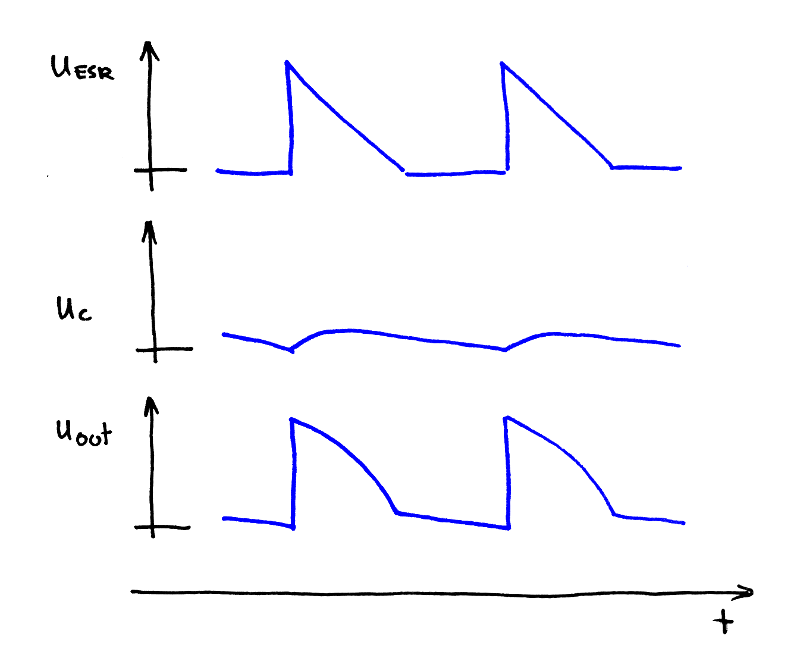 Before that point the slope is defined by the decaying current in the coil and the capacitor ESR. After that point, the slope is defined by the discharging output capacitor. The only feature still missing is the high-frequency noise we see on the oscilloscope. 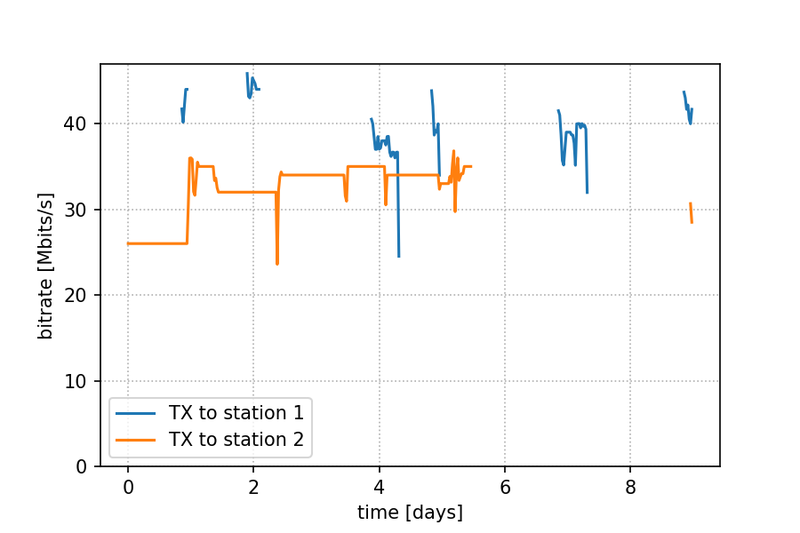 This is caused by the switching done by the THX203H. Abrupt changes in the current cause the leakage magnetic flux in the transformer and the capacitances of the diodes to oscillate. Since the output filter has been removed as a cost-cutting measure, the ringing can be seen unattenuated on the output terminals. 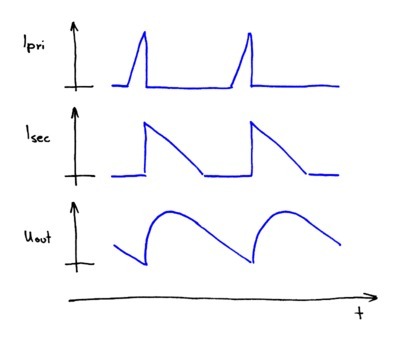 The smaller oscillations are caused by the primary switching on, while the larger oscillations that are obscuring the rising slope are caused by the THX203H switching off the primary coil. A while back I got a new work laptop: a 13" Dell XPS 9360. I was pleasantly surprised that installing the latest Debian Stretch with GNOME went smoothly and no special tweaks were needed to get everything up and running. The laptop works great and the battery life in Linux is a significant step up from my old HP EliteBook. The only real problem I noticed after a few months of use is weird behavior of the headphone jack, which often doesn't work for some unknown reason. In any case, this is my first computer with a high-DPI screen. The 13-inch LCD panel has a resolution of 3200x1800, which means that text on a normal X window screen is almost unreadable without some kind of scaling. 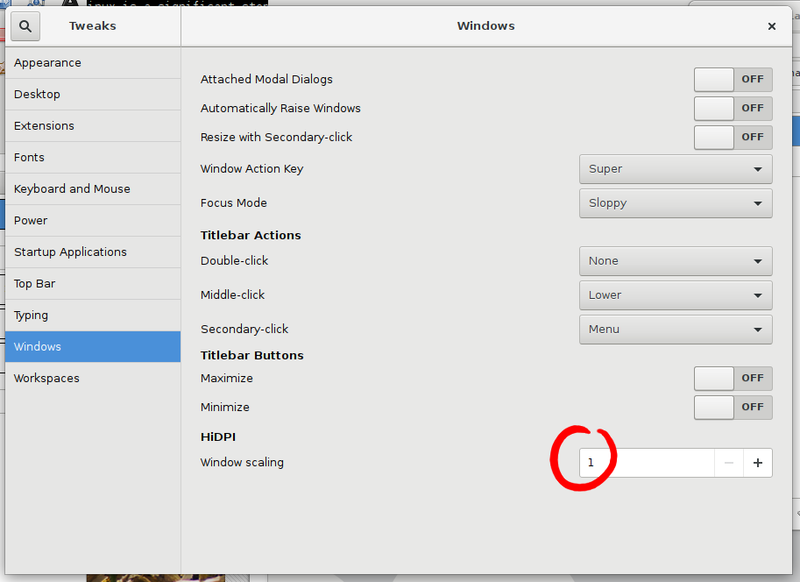 Thankfully, GNOME that ships with Stretch has a relatively good support for window scaling. You can set a scaling factor in the GNOME Tweak Tool and all windows will have their content scaled by an integer factor, making text and icons intelligible again. 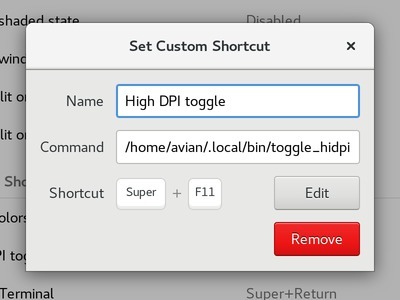 This setting works fine for me, at least for terminal windows and Firefox, which is what I mostly use on this computer. I've only noticed some minor cosmetic issues when I change this at run-time. Some icons and buttons in GNOME Shell (like the bar on the top of the screen or the settings menu on the upper-right) will sometimes look weird until the next reboot. A bigger annoyance was the fact that I often use this computer with a normal (non-high-DPI) external monitor. I had to open up the Tweak Tool each time I connected or disconnected the monitor. Navigating huge scaled UI on the low-DPI external monitor or tiny UI on the high-DPI laptop panel got old really quick. It was soon obvious that changing that setting should be a matter of a single key press. Finding a way to set window scaling programmatically was surprisingly difficult (not unlike my older effort in switching audio output device) I tried a few different approaches, like setting some dconf keys, but none worked reliably. I ended up digging into the Tweak Tool source. This revealed that the Tweak Tool is built around a nice Python library that exposes the necessary settings as functions you can call from your own scripts. The rest was simple. 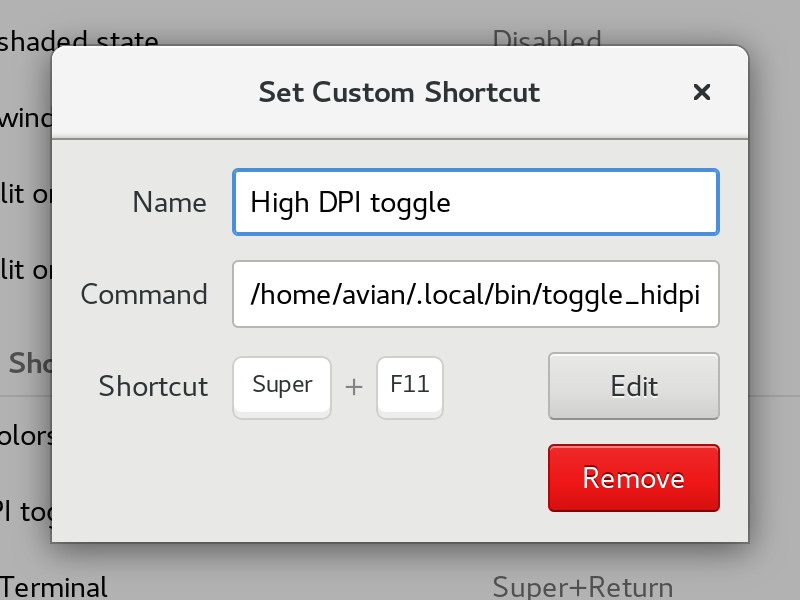 I have this script saved as toggle_hidpi and then a shortcut set in GNOME Keyboard Settings so that Super-F11 runs it. Note that using the laptop's built-in keyboard this means pressing the Windows logo, Fn, and F11 keys due to the weird modern practice of hiding normal function keys behind the Fn modifier. On an external USB keyboard, only Windows logo and F11 need to be pressed.